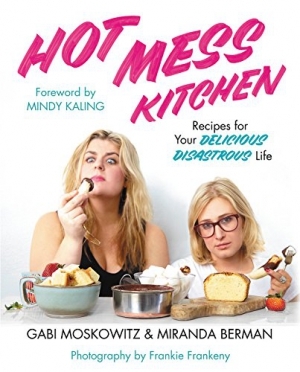 I resolve to cook more in 2015. I know that sounds absurd, since you are right reading my blog all about cooking, but hear me out. I want to cook more, better, and deeper in 2015. I want to eat real, whole, lovingly-prepared food, even when I'm tired. Even when I've been in meetings and on airplanes all day long and all I want to do is order dumplings and eat them in bed. I want to shop locally for fresh ingredients in small quantities, and cook them within a couple of days. Then I want to shop again. 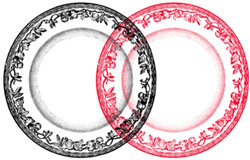 I want to cook, serve, and eat food that is utterly delicious in its simpleness. I want to be inspired by the seasons, not by food or diet fads. And I want to do it every day. This is not always easy (see aforementioned meetings/airplanes/dumplings scenario), but I still want to try. So I'm going to start with sauce. Building a meal around a sauce might seem counterintuitive (most people build meals around proteins), but it really helps me to plan meals better. Take, say, peanut sauce. If I make peanut sauce in the beginning of the week, I can make at least two or three meals with it. I can serve it with spring rolls and salad one night, then toss it with grilled chicken and broccoli and serve it over rice noodles. If I'm lucky enough to have more left, I can spoon it over grilled salmon and sauteed kale and serve it with brown rice. 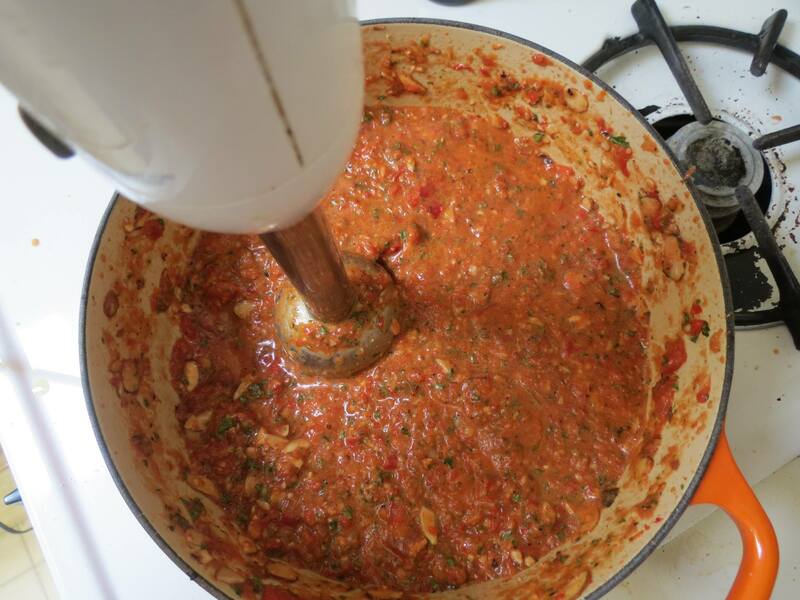 Romesco sauce is a similarly versatile sauce. It hails from Catalonia, Spain, and is often served with grilled bread. Here I've tailored it to my tastes, using sweet-hot cherry peppers in place of the traditional roasted whole red bell peppers. They give the sauce a pleasant but gentle kick of spice. I've also omitted the sometimes-called-for bread or bread crumbs, which I think make the sauce taste starchy. 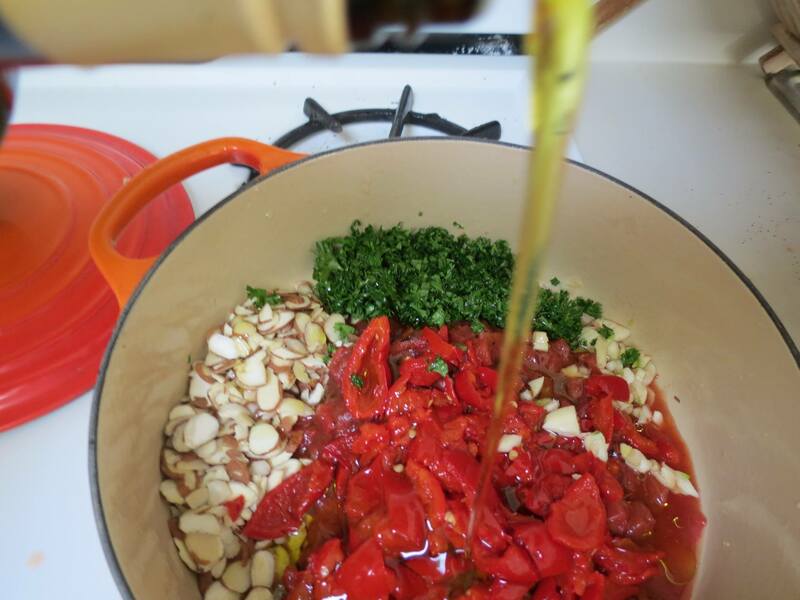 It's just peppers, tomatoes, garlic, parsley, almonds, good extra virgin olive oil, pepper, and salt. The sauce comes together in just a few minutes. An immersion blender makes the process easier (P.S. If you have a small kitchen, an immersion blender is a must-have appliance. It can do the work of several larger appliances, and it's small enough to be stored in a drawer), but a regular blender or food processor will also do the trick. Once the sauce is pureed, it will keep in a jar for up to a week, but I highly doubt you'll be able to wait that long to start using it. For dinner tonight, my plan is to grill some sausages, slice them up, and then cover them in romesco and Parm, and pop them under the broiler. Tomorrow, the leftover sauce will be my base for shakshuka for lunch, and then I'll toss some with roasted cauliflower to have with dinner. Meanwhile, for lunch today, I spooned a little over a bit of ricotta and ate it with some seed crackers. The romesco was garlicky, a little bit sweet, and just a touch on the spicy side. The creamy ricotta proved the perfect balancing addition, and the nutty crackers played nicely with the bits of almond in the sauce. So what about you? What are your cooking resolutions for this year? Whatever they are, I invite and encourage you to get your sauce on. Drain the cherry peppers, but reserve about 1/8 cup of their vinegar. Combine the cherry peppers, the reserved vinegar, and all remaining incredients except for the salt in a pot over medium heat and stir well. Cook for 5-10 minutes, just to gently mellow out the garlic. Puree using a food processor, blender, or immersion blender until desired consistency is reached (I like it slightly chunky). Use the sauce immediately (see headnote for suggestions) or store in an airtight container for up to a week. This is a very unique sauce. I would love to try it with grilled fish and chicken. It will also do great with fried dish. Where have you gotten the idea of using cherry in a sauce? It’s really amazing! 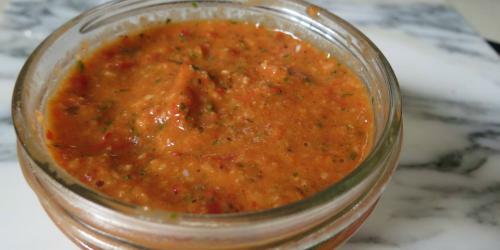 First of all, thanks for this wonderful Cherry Pepper Romesco sauce recipe as it comes really suitable one to my tastes. This one comes as a new one to try out and can’t wait to be tasting it. I’m a resume writer and working for an online firm providing resume help to job seekers. I love cooking a lot and hence have managed some time to spend on it every week. What helping me to get recipe of new and new items is the online web sources like this one from you. Thank you and keep sharing new recipes here with us all. These look delicious! Just discovered your blog and I love it! yummy food on a budget. Thank you and keep sharing new recipes here with us all. 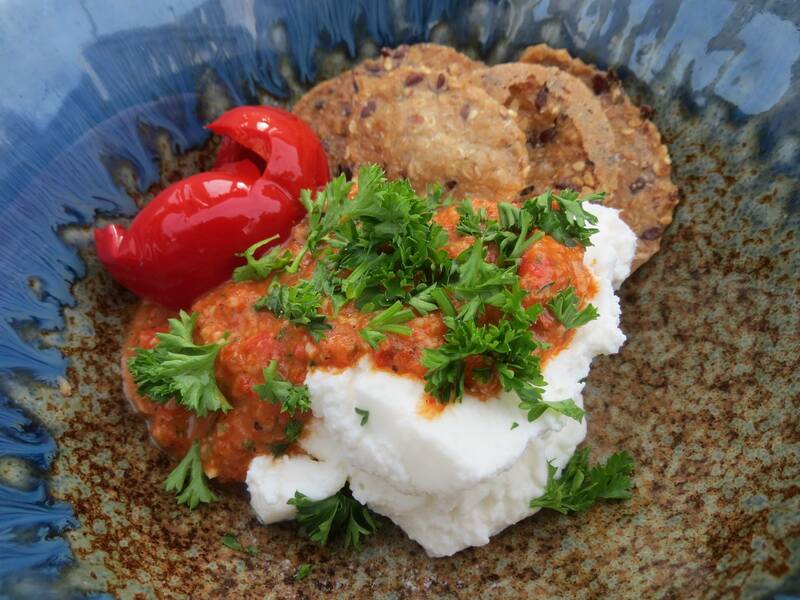 Cherry Pepper Romesco Sauce is yummy dish and cook time is 10 minutes, I will try on this holiday. 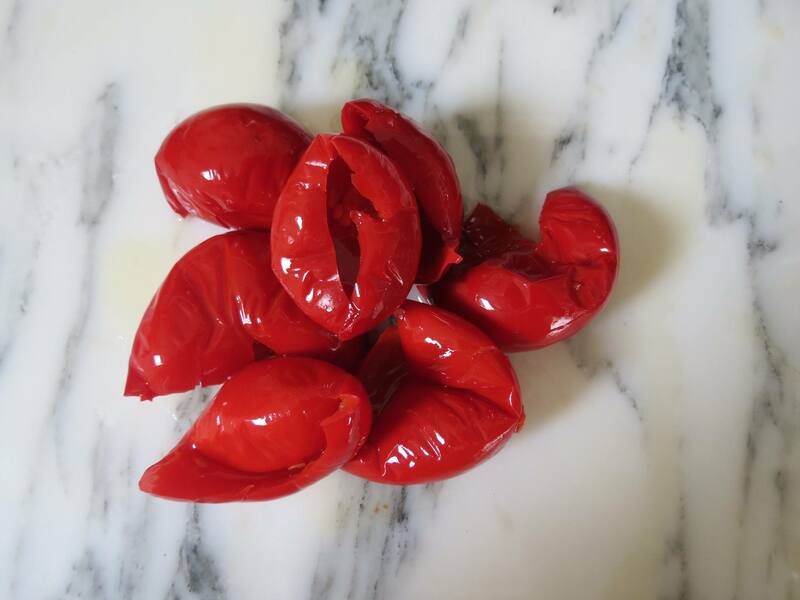 I am glad that you everyone enjoying cherry pepper romesco sauce because it is taste or yummy but i especially like the wonderful chicken dish. It is very nice and informative website.KEEP IT UP….. I think sauce is tasty,i gonna try this,thanks for sharing the great recipe. Now working is easy on PC, no need to remember the password and login again and again just login once and use that whenever you need to login.It is a browser which is made up for the best result and to save our time.widely used and people love this, it make thair work really easy. THANK YOU!! This post seriously MAKES my day. You are so kind and so talented, too–those photos are gorgeous. Thank you again! This looks really tempting. I’m gonna try making this very soon. Spicy and delicious, i like it. Our expert assignment helpers are available online 24*7 to solve the queries of the students. Students Assignment Help offers its best UK Assignment Help services to the students. This is a great bog. I am really excited to see the cherry pepper recipe! Anyway,Very Good Post,Thanks For The Share.! Thanks for sharing recipe with images. I lie your post, it’s a really helpful post for me This weekend I will try this recipe.